I was never interested in making cheesecakes in the past because it is not one of the desserts I like to eat. However, many people around me love cheesecakes. I made these mini cheesecakes for a get-together party from work and everyone seemed to love it. I’m still new to baking cakes and desserts but I have found one very good website that I often refer to. I’ve tried few recipes and all of them have turned out pretty well so far. The only change I make to the original recipes is reducing the amount of sugar used since I do not like my deserts to be very sweet. These mini cheesecakes are fun and easy to make and they are very adorable. I’ve made 2 batches with few different toppings but if you just choose one same topping for the whole batch, it wouldn’t be too much of work. Line 12 muffin cups with paper liners and set aside. In a bowl, combine graham cracker crumbs, sugar and melted butter. Divide this among the 12 muffin cups. Using the back of a cup or a glass, press the crumbs down so that they stick together and form a crust. Cover and refrigerate while preparing the filling. With stand mixer or handheld mixer, beat the cream mixture on slow speed until smooth. Add sugar and salt and beat to combine, scrape down the sides as necessary. Add eggs, one at a time and continue to beat until well blended. Add vanilla extract, lemon zest and sour cream and beat till combined. Divide the filling equally among the prepared muffin cups. Bake for 18 to 22 minutes or until firm. The center of the cheesecakes should still be a little wobbly. Remove from oven and place the tray on a wire rack to cool. One cool, cover with plastic wrap and refrigerate for few hours or overnight. Remove the paper liners before serving and top it up with fresh berries, dusting of cocoa powder, drizzling with berry sauce or melted chocolate. Store covered in fridge for several days. In a heavy bottom pot over low heat, combine cream, chocolate and sugar (if using), and stir until chocolate is melted and the mixture is smooth and uniform in color. Keep it aside to cool a little. In a microwave safe bowl, melt white chocolate in few seconds interval stirring at every interval. Place this in a small Ziploc bag and cut off the bottom corner of the bag to create a small opening so that the chocolate can be piped onto the cheesecakes. Pour a spoonful of dark chocolate mixture over the cheesecake, and pipe patterns with white chocolate. Dark chocolate mixture can also be piped to create patterns. 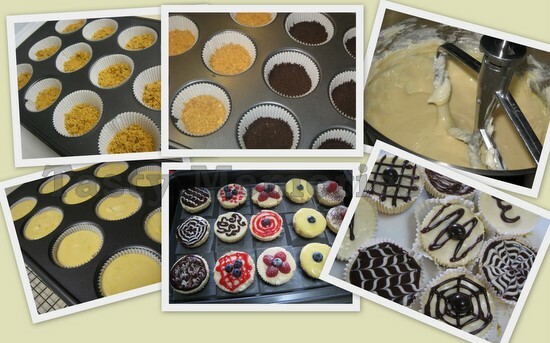 Refrigerate cheesecakes for few hours before serving. In a stainless steel bowl whisk together the egg, sugar and lemon juice until blended. Place the bowl over a pot of simmering water and cook whisking constantly until the mixture becomes thick (160 degrees F), for about 5 minutes. It will thicken more when cooled. Remove from heat and strain through a fine strainer to remove any lumps. Add butter and mix till melted. Add lemon zest and mix well. Cover with plastic wrap directly on the lemon curd to prevent the skin formation and let cool. Once cool, refrigerate for few hours until ready to use. The lemon curd can be refrigerated for up to a week. Note: I left out lemon zest in the cheesecake filling to be used with this topping. Cook raspberries and sugar in a small pot over medium heat until raspberries are broken down. Cook until desire consistency. Strain through a strainer to remove seeds. Let cool before using. Spoon over or pipe the sauce over the cheesecakes.